Make sure clothing always gets returned to its rightful owner with these no-iron clothing labels. They're great for jackets, school uniforms, baby clothes, blankets and backpacks. 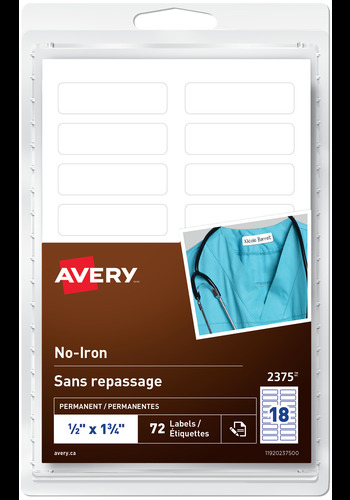 Make sure clothing and other items are returned to their rightful owner with these No-Iron Clothing Labels. They're great for labelling t-shirts, jackets, baby clothing, school uniforms, PE uniforms, hoodies and other clothing. They're also great for baseball caps, lunch boxes, blankets, luggage, backpacks, tennis shoes and other fabric items. Simply use a permanent marker to write on the no-iron labels, peel and stick. The labels are durable enough to stand up to multiple washer and dryer cycles, and they work on many types of fabrics. Keep clothing and other items out of the lost and found with these no-iron name and daycare labels. Easily apply labels without using an iron. Just write, peel and stick!